Here is a delic. recipe that is a healthy version, give it a whirl ENJOY!!!!!! 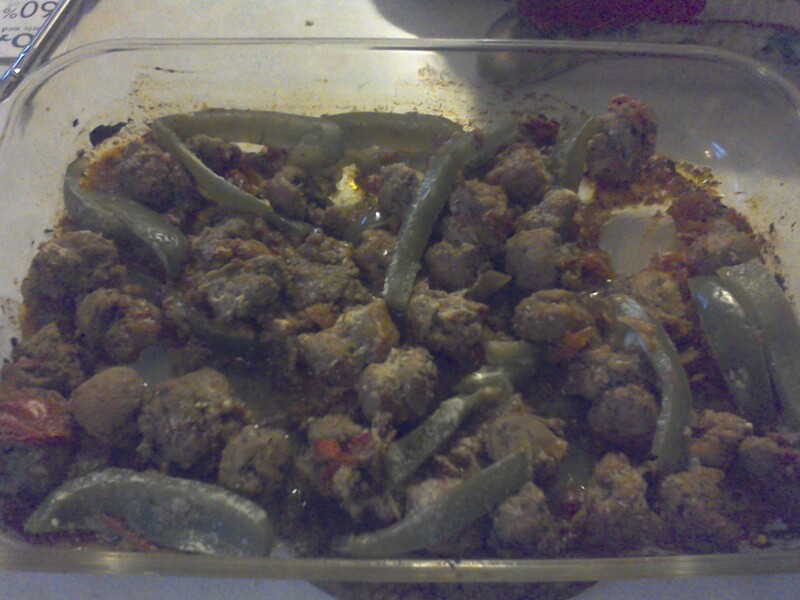 add sausage to pan and brown, then add veggies and sausage to glass baking dish and top with fire roasted tomatoes and parmesan then bake at 350 for 25-30min. serve with side salad or veggie combo of ur choice. to keep this in check with proper food combination, do not serve with any breads, pasta or potatoes. 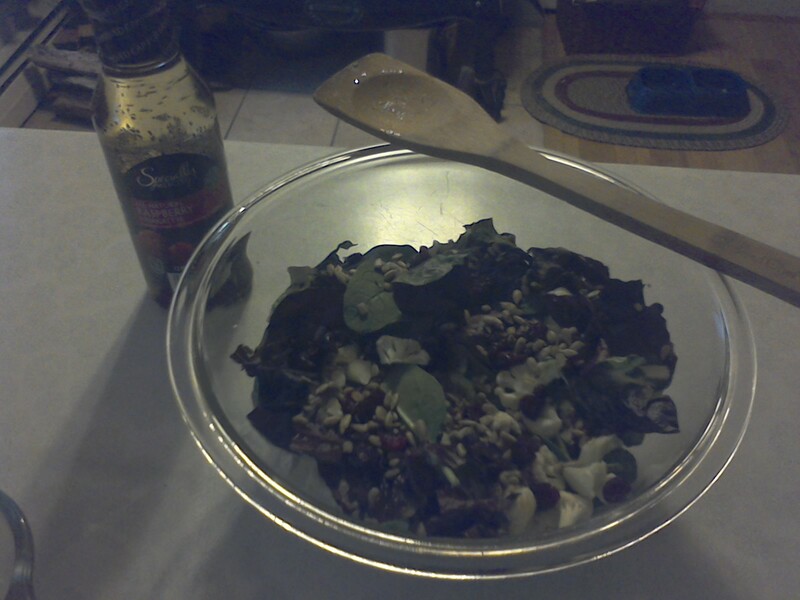 with raspberry vinegrette dressing or dressing of choice. Because Breathing is NOT optional! During cold/flu and pneumonia season, many people realize how important the element of being able to take a breath can be. You can live a few days without water & weeks without food, but you can only go a few minutes without air. So doing all that you can to care for the health of the respiratory system just makes sense. You will take probably 20,000 breaths & breathe about 35 lbs. of air each day. Plants are our co-companions in breathing. “We” breathe in air, our body uses the oxygen and releases carbon dioxide. “Plants” take in the carbon dioxide & release oxygen. Talk about team work!!! The actual anatomy of the respiratory tract includes the upper respiratory which include the nasal passages, sinues, pharynx & larynx, while the lower respiratory includes the trachea (windpipe), the bronchi & bronchioles (our airways), the alveoli (air sacs within the lungs) and the lungs. This entire system functions as a whole, what I mean by that is when one part of it is sick its more than likely going to affect the whole system. Sinus infection may also affect the bronchi & lungs. Asthma is characterized by inflammation & narrowing of the airways. They can’t breathe. Usually an asthma attack is activated by some sort of an irritant like pollen, mold, pet dander, or food sensitivities, like milk, wheat, or a reaction to chemicals, some attacks are triggered from exertion (playing or running), cold weather. Allergie rhinitis or hay fever these cause the nasal passages to become inflammed some of the typical symptoms are sneezing, runny or plugged up nose, coughing, nasal drip, itchy eyes, nose & throat. Some of the triggers are pollen from trees, weeds, grasses, flowers; and is mostly seen in the spring, summer & fall months. Hay fever can also be from mold, chemicals, dust mites animal hair. Basically what happens when someone who has a sensitivity, the immune system overreacts by sending a high alert to the white blood cells which release histamine & other inflammatory & irritating chemical compounds in the body to encourage more mucus production to wash out what isn’t welcomed to spend the night. So when the histamine levels increase coupled with other body defenses we can see wheezing, itching, swelling, mucus overload. C.O.P.C (Chronic obstructive pulmonary disease) a.k.a. emphysema is a disease where the alveoli of the lungs have lost their ability to be elastic and they are floppy, like loose elastic with very little snap left. So people with COPD have a difficult time taking deep needed breathes , so they are low on oxygen intake which shows itself with shortness of breath, lots of mucus. We know smoking to be a common cause, but being around lots of chemicals in the form of pollution, dust etc. can also be a cause for some people. 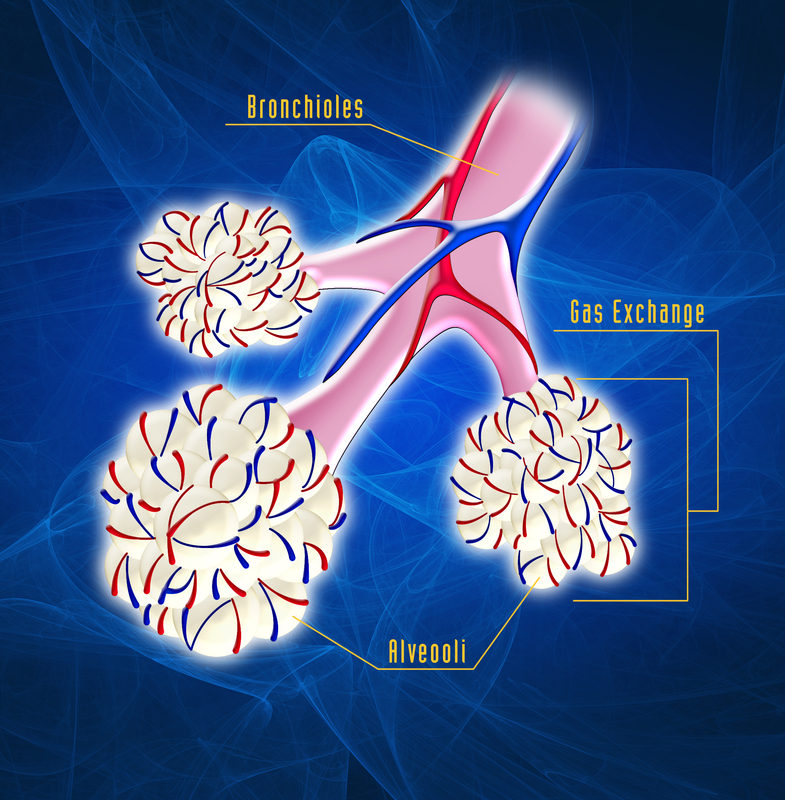 CHRONIC BRONCHITIS is inflammation of the bronchi, people who are smokers, or around toxins or irritants can get this which also falls in the COPD catagory. Shortness of breath wheezing and a loose wet cough usually show up here. COLD this is a common infection with one or more contagious viruses. Most people have experienced this at one point or another, I personally/professionally believe that we don’t “catch” a cold but we “earn” it. The symptoms that we experience are simply our bodies doing some drastic housecleaning inbetween season changes (i.e. isn’t this when most people experience one of these?) However, there are some virus invaders that can trigger a sore throat, low fever, plugged nose, achy body, coughing & sneezing. 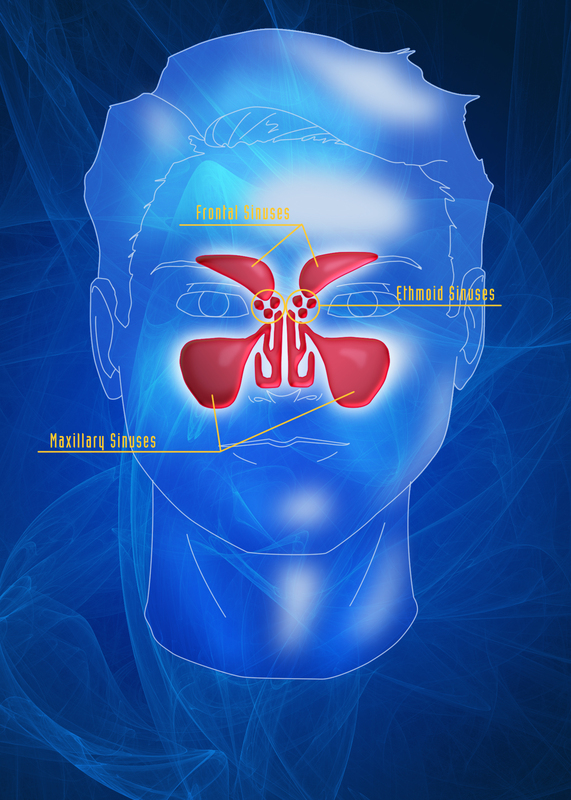 Sinusitis is an infection/inflammation of the sinuses, the body produces lots of mucus. When the nasal cavities swell, the draining can be slowed leading to that infamous sinus pressure/pain we all love so much. Croup is a viral infection we see in mainly children under the age of 6. To recognize this the child usually has that barking cough and the vocal cords can swell. In extreme cases the child can have trouble breathing, so pay attention. The Flu is caused by many different viruses. You can experience body aches, fever, chills, cough, headache, sore throat. Usually the flu comes on out of the blue and hits ya like a truck. Acute bronchitis is short-lived inflammation of the bronchi usually caused by either a viral or bacterial infection. Usually we see this come on the scene about 3 to 4 days after an upper respiratory infection came to visit like the flu. You mainly experience a cough which usually starts out dry but can lead to mucus being brought up. Many get hoarse, low fever, wheezing and usually some pain in the chest that hurts worse when a deep breath is taken or while coughing. Pneumonia is an infection from either virus or bacteria and mold that causes inflammation of the lungs which can bring on fever, chest tightness, difficulty breathing, coughing & wheezing. WHAT DO WE DO WITH THESE SYMPTOMS AND WHATS THE BEST WAY TO WORK WITH THEM? Many of us are taught how to treat these symptoms “wrong” thru commercials/advertising for Over the counter products. When we develop a cough this is how the body deals with tossing out foreign bad guys from the lower respiratory tract. So in a nut shell a cough is a reflex that is designed to protect our lungs, and to assist in clearing the airways from germs, toxins & mucus to help prevent infection. Natural support of our respiratory system when it’s under attack. Our body comes pre-equipped with something we call an immune system. So when our repiratory system is under attack, the immune system jumps to alert to ward off an attack in several different ways. Believe it or not most of our respiratory symptoms we experience during an invasion (viral/bacterial) is caused “BY” the immune system, yet understand how helpful these symptoms really are, and they are essential in our body overcoming the enemy within. Let me walk you thru this. When the “bad guy” tries to enter thru the cells in the nose, throat & lungs, the cells let loos of inflammatory compounds that call the white blood cells to the site they landed on. The white blood cells attack, destroy and engulf the invader. As these white blood cells complete their job, they begin to accumulate by the millions. Coughing, sneezing and a runny nose help remove these white blood cells, as well as the bad guy and by products of infection from the sinuses, bronchi and lungs. We are taught by advertisers that these symptoms are “bad” for you. No they are not, they are not comfortable to experience I will agree with you there. But in reality, it’s not the symptoms that are bad for you, it’s the infection that brought these symptoms to bear. Trying to suppress the symptoms rather than eliminate the cause is really counterproductive because you then are going to suppress the body’s natural alert system that responds to invasion. When you are coughing, and you are tired of coughing, you may decide to take a cough suppressant (something to make you “stop” coughing). Essentially what this does is it allows the germs, mucus and toxins to accumulate in the lungs & makes your chances of getting pneumonia higher. Or taking a medication to dry up the mucus can allow the bad guys to set up house keeping in the sinus area resulting in a sinus infection. The other benefit of a fever is that when the temperature goes up it speeds up lots of other necessary healing and detox reactions. It causes the heart to beat faster, which delivers blood & nutrients to the respiratory tract & helps to remove the trash. Higher temperatures speed enzyme reactions, we have systemic enzymes as well as digestive, the systemic enzymes break down and kill pathogens and also assist in tissue repair at the sign of the invasion/fight zone. A fever also encourages us to breathe faster which helps the metabolic waste gases to be released faster from the body. So when you take something to reduce the fever, the cough, the runny nose, you are essentially slowing down the healing process designed by God to fix the problem. By drinking lots of water you are helping the respiratory tract function at full capacity. why? because it helps keep the air humidified. By the time the air reaches the alveoli of the lungs, it is more than 95% saturated. So drinking plenty of water also keeps the mucus coating of the respiratory system moist & sticky so that it can trap & remove allergens, and bad guys. ALJ helps to soothe tissues & promotes cleansing of the respiratory tract by encouraging the expulsion of mucus. This is available in capsules or liquid. Lung Support TCM: acts as a tonic to moisten & nourish the tissues of the respiratory tract, specifically the lungs, making it helpful for dry irritating coughs. Seasonal Defense: COMBINES ANDROGRAPHIS WITH IMMUNE SUPPORTING HERS FOR COMPLETE IMMUNE SUPPORT. Teifu Essential Oil; I love this stuff…. it invigorates the mind, stimulates the respiratory system, offers cleansing, refreshing & softening properties. This also works great for helping with headache apply right where it hurts. High Potency Garlic: garlic can be of benefit to support immune system, and helpful in overcoming respiratory issues. If any of you would be interested in a one on one consultation to custom fit a particular natural health care routine for you.. you can go to http://mkt.com/harvested-health-llc and sign up for a 1 hr. consult and/or QFA Analysis and we can get to work on a specific program designed around your unique needs.